The Attack, a painting of the Ottoman forces at Domokos, by Fausto Zonaro. The Battle of Domokos (Turkish: Dömeke Savaşı) was a battle between the Ottoman Empire and the Kingdom of Greece. This battle was a part of the Greco-Turkish War (1897). The commander of the Ottoman army at Elassona (Turkish: Alasonya) was Edhem Pasha (later gained the title Gazi) . He was one of the younger generals of the Ottoman Army (then 46) and his appointment perplexed many. The commander of the Greek army was the Prince Constantine, the Ottoman army in Domokos was 45000 strong and the Greek army was 40000 strong  The Greek side also had 2000 Italian irregulars under the command of Ricciotti Garibaldi. According to a contemporary source following initial victories, Ethem Pasha had some of his troops in Velestino (which was the theatre of two former battles) and most in Pharsala, but there was a momentary pause after the second battle of Valestino. 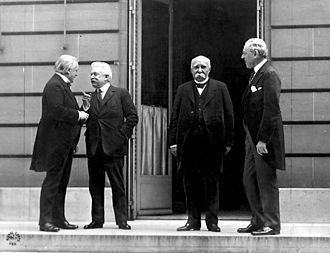 The new Greek prime minister Dimitrios Rallis was anxious to accept the mediation which the Great Powers were willing to undertake. Failing to reach a compromise, Edhem Pasha marched from Phasla to the town of Domokos (Dömeke) on 17 May 1897. Domakos was the stronghold of the Greek army against the advancing Ottoman army. Ethem took the initiative and advanced to Thermopylae about 40 kilometres (25 mi) south. Although the pass was heavily defended by the Greek army it was captured, but the Ottoman grand vizier Halil Rifat Pasha was planning to capture Athens (to be used a bargaining chip in the future negotiations). Nevertheless, the Great powers of Europe forced the Ottoman government for armistice. Two days after the battle both sides ceased fire. ^ a b c d von Strantz, Karl Julius W. Viktor (1900). Modern Warfare: As Illustrated by the Greco-Turkish War. S. Sonninschein and Company. pp. 186–203. Retrieved 16 March 2016. ^ a b c d e Welsh, Charles, ed. (1905). Famous Battles of the Nineteenth Century: 1875-1900. A. Wessels Company. pp. 251–262. Retrieved 16 March 2016. The Battle of Ankara was fought on 20 July 1402 at the Çubuk plain near Ankara between the forces of the Ottoman Sultan Bayezid I and Timur, ruler of the Timurid Empire. The battle was a victory for Timur, and it led to a period of crisis for the Ottoman Empire. Timur, a Turco-Mongol from Transoxiana, had built an empire in Central Asia over the years and he sought to rebuild the once great Mongol Empire. In the 1380s and 1390s, he invaded and conquered parts of Persia, ravaged southern Russia and Ukraine, in 1400–01 Timur took Sivas from the Ottomans, parts of Syria from the Mamluks, and next directed towards Anatolia. Meanwhile, in 1402, the Ottomans had been campaigning in Europe, Bayezid broke off the blockade of Constantinople and marched to Ankara after Timur again moved his army to the southeast in the summer of 1402. It is estimated that the Timurid army counted 140,000, mostly cavalry, historical sources exaggerated the number of troops, Ahmad ibn Arabshah claimed 800,000 Timurid troops, while a German witness claimed 1,6 million, for instance. The Ottoman force included contingents under his sons, Janissaries, Anatolian Muslim vassals, among Serbian vassals participating were Stefan Lazarević and Đurađ Branković, and among Albanian were Koja Zakarija, Demetrius Jonima, Gjon Kastrioti, and probably Tanush Major Dukagjin. 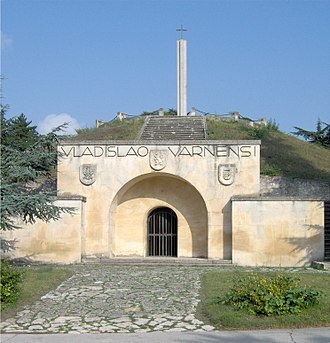 Christian vassals that did not participate were Wallachian Mircea and Zetan Konstantin Balšić, a quarter of the Ottoman troops were recently conquered Tatars. 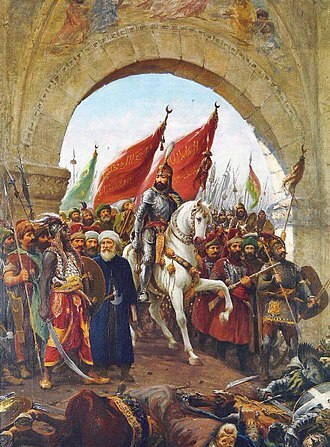 Bayezid reluctantly withdrew his forces from the blockade of Constantinople and marched them through the midsummer heat, when they arrived, they were tired and thirsty, but were allowed no time to rest or recuperate. Bayezid instead chose to take a stance and marched eastward. Advancing Ottoman scouts found no traces of the Timurids, who secretly marched southwest, the Timurids encamped in the same locations that the Ottomans had previously occupied, making use of abandoned tents and water sources. In the Timurid army, Timur commanded the centre, his sons Miran and Rukh the right and left, the battle began with a large-scale attack from the Ottomans, countered by swarms of arrows from the Timurid horse archers. 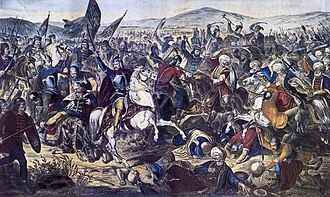 The Second Battle of Kosovo was fought at Kosovo Polje between a coalition of the Kingdom of Hungary and Wallachia led by John Hunyadi, against an Ottoman-led coalition under Sultan Murad II. The result of the battle was a decisive Ottoman victory, in 1448, John Hunyadi saw the right moment to lead a campaign against the Ottoman Empire. After the defeat at the Battle of Varna, he raised another army to attack the Ottomans and his strategy was based on an expected revolt of the Balkan people, a surprise attack, and the destruction of the main force of the Ottomans in a single battle. In September 1448 Hunyadi led the Hungarian forces across the Danube river and camped them in Serbia next to Kovin, for a full month the Hungarians were encamped there awaiting the German crusaders, the Wallachian Duke as well as the Bohemian and Albanian army. The Albanian army under Skanderbeg did not participate in battle as he was prevented from linking with Hunyadis army by the Ottomans. It is believed that he was delayed by Serbian despot Đurađ Branković, allied with Sultan Murad II, as a result, Skanderbeg ravaged Brankovićs domains as punishment for deserting the Christian cause. 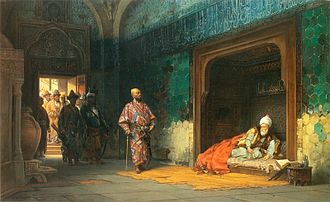 Branković reacted ambiguously at the trespassing and negotiated the terms of joining the Crusade against the Ottomans over that period of time. Branković was weary, having had his realm restored after a full-scale Ottoman occupation only in 1444, Despot Branković was unwilling to set himself under Hunyadis command under any condition, as he personally disliked him, considering him of lower stature. The central point of the dispute between Hunyadi and Branković was their personal quarrel and this had included gifting Hunyadi with the his possessions in the Hungarian Kingdom in favor of a pacifist approach. After Hunyadi eventually joined the side, Branković had asked for the return of his properties. The Serbian rejection and positioning as a side had led to Hunyadis fury. 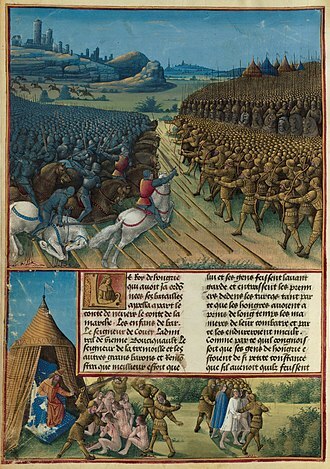 At the end of the negotiations, Hunyadi had threatened to kill Branković in person after his country was occupied, in late September 1448, Hunyadi had amassed 30,000 men and moved southwards. The Crusaders pillaged and burned across Serbia, but the Serb Despot gave an order of free passage. Thermopylae is a place in Greece where a narrow coastal passage existed in antiquity. It derives its name from its hot sulphur springs, the Hot Gates is the place of hot springs and in Greek mythology it is the cavernous entrances to Hades. Thermopylae is the land route large enough to bear any significant traffic between Lokris and Thessaly. This passage from north to south along the east coast of the Balkan peninsula requires use of the pass and for this reason Thermopylae has been the site of several battles. In ancient times it was called Malis which was named after the Malians, the Malian Gulf is named after them. 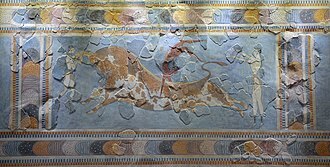 In the western valley of the Spercheios their land was adjacent to the Aenianes and their main town was named Trachis. In the town of Anthela, the Malians had an important temple of Demeter, the land is dominated by the coastal floodplain of the Spercheios River and is surrounded by sloping forested limestone mountains. There is continuous deposition of sediment from the river and travertine deposits from the hot springs which has altered the landscape during the past few thousand years. 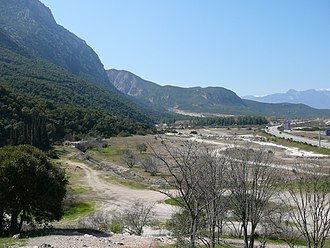 The land surface on which the famous Battle of Thermopylae was fought in 480 BC is now buried under 20 metres of soil, the shoreline has advanced over the centuries because of the sedimentary deposition. The level of the Malian Gulf was higher during prehistoric times. Its shoreline advanced by up to 2 kilometers between 2500 BC and 480 BC but still has several extremely narrow passages between the sea and the mountains. The narrowest point on the plain, where the Battle of Thermopylae was probably fought, a main highway now splits the pass, with a modern-day monument to King Leonidas I of Sparta on the east side of the highway. It is directly across the road from the hill where Simonides of Ceoss epitaph to the fallen is engraved in stone at the top. Thermopylae is part of the horseshoe of Maliakos known as the horseshoe of death, it is the narrowest part of the highway connecting the north. It has many turns and has been the site of vehicular accidents. The hot springs from which the pass derives its name still exist close to the foot of the hill, Thermopylae translated to English means hot gates and the name is related with its hot sulphur springs. The Evzones, or Evzoni, is the name of several historical elite light infantry and mountain units of the Greek Army. Today, it refers to the members of the Presidential Guard, a ceremonial unit that guards the Greek Tomb of the Unknown Soldier, the Presidential Mansion. An Evzone is known, colloquially, as a Tsoliás, though the Presidential Guard is a primarily ceremonial unit, all Evzones are volunteers drawn from the Hellenic Armys Infantry Corps. Prospective Evzones are initially identified at the Infantry Recruit Training Centres during Basic Training, the unit is known for its uniform, which has evolved from the clothes worn by the klephts who fought the Ottoman occupation of Greece. The most visible item of uniform is the fustanella, a kilt-like garment. Their distinctive dress turned them into an image for the Greek soldier. 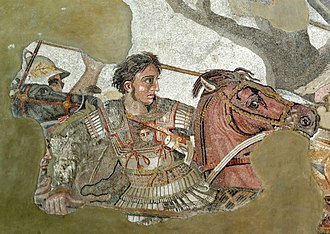 The word evzōnos is first attested in Homers Iliad and derives from εὖ and ζώνη, the word was used by ancient writers for centuries to describe a type of light infantry of unidentified equipment, probably used as a generic term to denote light infantry. In 1833, after the arrival of King Otto, the Greek Army was organized along new lines, the Bavarian soldiers that had come with Otto formed the majority of the European Line Infantry battalions. Each of these included one rifle company, designated as Skirmishers or Evzone. In addition, ten light Skirmisher battalions were formed from Greeks, in 1836 these battalions were reduced to four, and eight Mountain Guard battalions were formed in their stead, they were grouped into four regiments in 1843. These units were engaged in patrolling the frontier, combating insurgents. 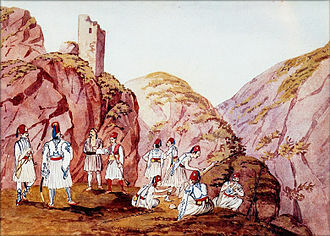 The Mountain Guard was incorporated in the strengthened Skirmisher battalions in 1854, in December 1867, the first four elite Evzone light battalions were formed, of four companies each, with the task of guarding the frontier. 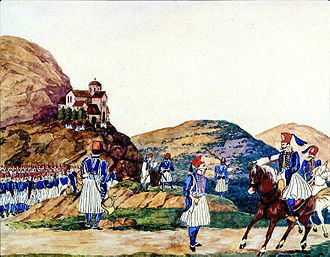 On 12 December 1868, the Royal Guard detachment, initially named Agema, the Palace Guard, in 1880-1881, the Evzone units were expanded to nine battalions. 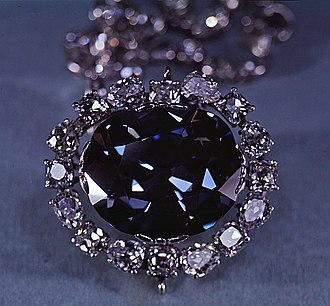 They participated in the disastrous 1897 war with Turkey as elements of the infantry divisions. The Greco-Turkish War of 1897, called the Thirty Days War and known in Greece as the Black 97 or the Unfortunate War, was a war fought between the Kingdom of Greece and the Ottoman Empire. 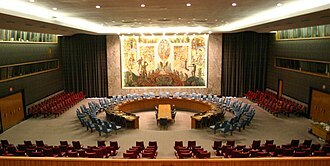 Its immediate cause was the question over the status of the Ottoman province of Crete and this was the first war effort in which the military and political personnel of Greece were put to test since the Greek War of Independence in 1821. For the Ottoman Empire, this was the first war effort in which the military personnel were put to test. The Ottoman army was under the guidance of a German military mission under Colmar von der Goltz who had reorganized it after the defeat in the Russo-Turkish War, the Ottoman commissioners, repeatedly ignored the convention, causing three successive rebellions in 1885,1888 and 1889. 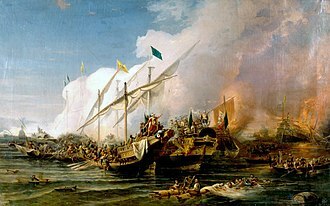 To quell the unrest, Ottoman military reinforcements arrived while Greek volunteers landed on the island to support the Greek population, at the same time the fleets of the Great Powers patrolled the Cretan waters, leading to further escalation. Nevertheless, an agreement was reached with the Sultan and the tensions receded, in January 1897 inter-communal violence broke out as both sides tried to consolidate their grip on power. The Christian district of Chania was set on fire and many fled to the fleet anchored outside the city. A struggle for independence and union with Greece was declared by Cretan revolutionaries, Greek Prime Minister Theodoros Deligiannis was subjected to fierce criticism by his adversary Dimitrios Rallis over his alleged inability to handle the issue. 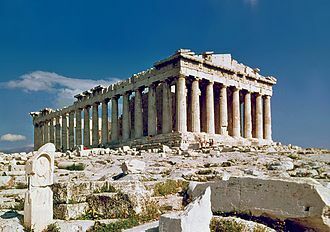 Continuous demonstrations in Athens accused King George I and the government of betrayal of the Cretan cause, the National Society, a nationalistic, militaristic organization that had infiltrated all levels of the army and bureaucracy, pushed for immediate confrontation with the Ottomans. On 25 January 1897 the first troopships, accompanied by the battleship Hydra, sailed for Crete, on 2 February, despite the guarantees given by the Great Powers on the Ottoman sovereignty over the island, Vassos unilaterally proclaimed its union with Greece. The main roads through Albania and the most common Ottoman invasion routes. Sword surrendered by Edhem Pasha after the defeat by the Russian Empire in the Siege of Plevna, 1877. Domain of King Vukašin Mrnjavčević and Despot Jovan Uglješa before the Battle of Maritsa (in 1371).